I'm still excited about marking the TWM 10th Anniversary! Since there's a Visioning Workshop coming up this Saturday, I thought it'd good to look back over my past collages. 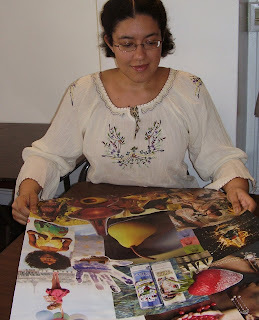 I discovered Visioning about six years ago, so I have nearly twelve collages posted on my office walls. Each collage speaks of a moment in my life; they are little snapshots of what I happened to be going through at the time I made them. Each evokes different emotions when I look at it. Some still feel resonant, like there is unfinished business within the images, while others feel more settled, like pieces of the past, old photographs. I find recurring themes that crop up over and over: close-ups of hands making things, strong female images, peacocks, winding roads, leafless trees. One thing that strikes me is the sheer volume of images, and all the potential meanings each piece of each collage could hold for me. It could become overwhelming, but instead I feel a sense of calm, of richness, of bounty. I don't believe that images have inherent power, but that their significance comes from interpretation, which means that plentiful feeling must originate inside of me. I cannot be all the things I ever dreamed, but seeing the possibilities all laid out in front of me helps me realize that the cream does rise to the top, and I am living the life I am meant to, day by day. If you've never done a vision board with TWM, now is a good time to try it! All week, we've been celebrating TWM's 10th anniversary and now it's your turn to join us. What does TWM mean to you? Share some of your favorite TWM memories -- perhaps a program you learned a lot from or a collage at a Visioning Workshop that changed your course. Continuing this celebration of TWM’s 10th anniversary, we wanted to post this from founder Kristina Leonardi as a way of giving thanks to all of TWM’s supporters including our awesome CHICKS ROCK! readers. Thanks to TWM for creating this platform for all of us who write regularly, guest blog, comment, and read. Ten years ago, The Women's Mosaic held its very first meeting at Taipei Noodle House on the Lunar New Year of the Snake January 24, 2001! We started out with a basic email blast to about 50 women, 35 of which showed up at that first gathering. Since then we've offered more than 95 unique events and have grown to a community of over 5,000 dynamic women and men both here and abroad, helping them connect to themselves, each other and the world around them! In addition to new programs, this year we'll be taking a look back at events we've offered over the past decade, so stay tuned for TWM Flashbacks and TWM Connections with reviews, comments and updates from members and attendees! But today we simply want to acknowledge and show our sincere appreciation for some key support we've received throughout the years, so we want to give a special shout out to Michele Lambrech, Christina Bellini, Melanie McEvoy and Kekla Magoon as past and present board members, our special team of volunteer staff and pro bono help, Sally Mercedes, Mara Leonardi, Scott Damashek, Alan Scott, Heather Floyd, Christina Quintero, Michelle French, Padma Vaidyanathan, Christianna Mihaiu, Pauline Karakat, Chris Kopek and Craig Wenrich and to all of our current and past volunteers, interns, TWM Members and donors who keep us keepin' on - we couldn't have gotten this far without any of you! And last, but certainly not least, a big rockin' thanks to all of our TWM eNewsletter readers, event attendees, Facebook Fans, Twitter followers and blog subscribers - we hope to keep you inspired and connected for many years to come. I first learned about The Women’s Mosaic back in 2007. My sister and I attended a conference where we heard Kristina Leonardi speak about her journey to the creation of the non-profit organization, which I remember being impressed by. I talked to Kristina afterwards to ask more questions about TWM and her experiences. After a year in Indonesia, I was wondering about my own journey; I still am of course. I find myself enriched by the opportunities and experiences I have had through TWM. Before teaching abroad in Indonesia, I was convinced that I would never be much of a public speaker. I challenged myself when I went abroad to teach, because having command of a classroom is no easy feat. I learned to speak with conviction to help my students understand their lessons, which I treasure to this day. When I returned to the U.S. and got involved with The Women’s Mosaic, I continued to use my voice in different ways. I attended a few college career fairs as a TWM representative and talked to those interested in internships for college credit. I think I did a good job promoting the organization and its many cultural and educational benefits. I enjoyed talking about something I believed in, and I think it showed; it still shows today. There have been various TWM events and programs I have enjoyed being a part of, but being a CHICKS ROCK! Blogger has definitely been the most significant. Every week, Kekla, Sally, and I share our thoughts and experiences, as do our guest bloggers and Kristina herself on occasion. I enjoy connecting with TWM and non-TWM members on the blog most of all. It has been quite a decade for The Women’s Mosaic! I look forward to what the future will bring to the organization. Straight out of college, my first internship was with The Women's Mosaic. I was thrown right into an event -- the summer fundraiser -- setting up, meeting people, putting out any fires that started, etc. It was intense and a bit overwhelming, but I felt the connection immediately. The energy, mission, and commitment were just what I needed, and I never looked back. My role has changed over the years as my interests and as the skills I want to work on have changed. I've planned events, assisted with grants, and designed CHICKS ROCK! as a way of reaching more women and staying connected with the women who already know the great work TWM does. Some people wonder how it is that I've been able to do so many different things in my time here, and it's all because of Kristina. True to the mission and vision of TWM, Kristina's primary goal has always been to make sure that I'm growing personally and professionally by helping TWM. She would often check in with me to ask me about my career goals and let me know what project I could take on next to get me started on reaching those goals. It's this encouragement and the need to put us first that keeps me around. No matter what, I know that Kristina and the women of TWM are looking out for me. Even if I do end up moving, I can't imagine disconnecting from TWM, so it's a good thing I'll still have CHICKS ROCK! and other online outlets to turn to. I've become part of this community and wouldn't be able to leave it behind so easily. Heck, I'd probably seek out other women looking for personal growth, empowerment, and a ways to connect with other cultures, bring them together, and introduce them to the organization that's been pushing me forward for all these years. Today marks the 10th Anniversary of The Women's Mosaic's founding! This week at CHICKS ROCK! we'll be celebrating this organization that has meant so much to all of us. I discovered The Women's Mosaic (TWM) in the spring of 2002, at a career/activities fair for young women. I was staffing a booth that happened to be located directly across the room from TWM's booth. Being relatively new to New York, and eager to meet new people, I was attracted to the large photo display board of diverse-looking women. All afternoon, I gazed at it, wondering what it was about. But, being a conscientious employee, I was concerned about leaving my own booth unattended in order to explore things at my leisure. But the call was too great. Eventually, I talked myself into wandering over. I'll be really quick, I thought. And I was. It took but a few brief moments to scurry over, grab a brochure, and jot my name on the mailing list. Little did I know, it was but the first of many times TWM would draw me beyond my comfort zone. I lingered on the mailing list for months before I was able to come to an event, but getting involved was one of the best choices I made in my first years in the city. I made new friends and got monthly doses of the diverse interactions and focused conversation that I craved. Soon I was writing grants for the organization, staffing events, and participating in a Visioning Workshop that sounded to me at first "neat but weird," and which I now wouldn't want to live without. Sometimes being with TWM does feel like wandering into the unknown, leaving behind the things I know and am familiar with. I've never written a grant before--why are they trusting me to try this? Six months later, I got a job as a grantwriter. I've never blogged regularly before--do I have enough to say? Here I am two years into it, happily typing away. Happy Birthday, TWM! Thanks for everything. I wouldn't be who I am today without you. We here at CHICKS ROCK! love few things more than a great book. It's been a while since we gabbed about our favorite reads, so we want to know: of the books you've read in the last year what are some of the favorites? What was it that you loved so much about them? While you're gearing up for TWM's Visioning Workshop, or if you already know you can't make it, you can swing by TWM founder & CHICKS ROCK! guest blogger Kristina's New Year's Workshop on Saturday. Check out the details below. Every winter, I spend a weekend with a group of my sorority sisters, helping them with the business end of things and also catching up. I have to admit that some years are better than others. If business takes too long, for example, those of us who are well out of college are bored for hours. But this year was easily the best time I've had. We played Taboo for hours, updated each other on everything going on in our lives, gossiped, and looked back on our favorite memories together. Some of these women I've known for almost nine years and some I've barely known for nine months. Some of these women I speak to almost on a daily basis and some I've only had a handful of conversations with. No matter which group we fall into, however, our sisterhood lets us skip any awkwardness or pretense and jump right into things when we get together. I went into the weekend not expecting much, but it was one of the best times I've had in months. Most importantly, I came out of it feeling a stronger connection to my Hermanas. Our time together reminded me of the reasons I joined this organization in the first place: to make a difference in my community, to uplift other women, and to create a bond with a group of people who I would love unconditionally and indefinitely. Even though we don't always get along or agree on everything, we are there for each other when we need it most, even if we don't realize just how much that is. On Martin Luther King, Jr. Day it always seems that my task here becomes a little bit bigger. I want to say something significant to honor the legacy not just of one exceptional man, but of an entire movement, an entire generation of people who struggled and died so I could enjoy the freedoms I take for granted today. All in 350 words or fewer....Yikes. I feel a connection to this legacy, in part because I've studied the history and am truly grateful for the change wrought by the civil rights era. In part because I see the change that still needs to happen. And maybe in part because I think I'm supposed to, being a black American and all. Still, I find myself floundering for the right words to respond to something so momentous. This morning, in reference to the Rev. Dr. King, someone quoted me a line from a poem by Elizabeth Alexander: "We all crave radiance in this austere world." I wonder sometimes how austere the world can become: We live in a time of war, and one in which violence can occur seemingly at random against a Congresswoman and an innocent, unsuspecting crowd, including children. Because of those things, I now live in a world in which an oddly-dressed stranger walking into a private meeting immediately conjured in my mind images of a random, psychotic shootout. Bit by bit compassion falls by the wayside, in service of fear. In the midst of it all, I cling to the sense of triumph and sacrifice that this day is supposed to symbolize. For Dr. King, the first response--even in the face of terror--was never fear, it was courage. His dedication to what was right never faded in the face of all that went wrong. Most amazingly of all, he never had to stand alone. Thanks, Dr. King, for your too-brief flash of radiance. Let us not imagine that your torch has burned out, but rather that it exploded and burst forth flinging bits of flame. Let us imagine capturing those tiny fires on torches of our own and walking forward through the night until the dawn washes over us all. There were a lot of events in the news this week: the anniversary of Haiti's devastating earthquake, the floods in Australia, the shooting in Tucson, AZ and President Obama's subsequent address, and so forth. It's easy to ignore things if they don't directly affect you because we can't always connect current events with a real face. So we want you to speak up if you've been affected. Have any of these tragic events affected you? What would you like to say to those of us who might not know everything that's going on? Due to popular demand, The Women's Mosaic is now offering their Visioning Workshop three times a year! Even better than that, the next one is right around the corner. Just as you start to settle into your routine this new year, TWM's Visioning Workshop can help you get focused and take on the year with a clear mind. Be sure to RSVP so you can claim your spot before it sells out. Saturday, February 5th, 11:00 a.m. - 5:00 p.m.
Come to our popular and powerful semi-annual workshop for a creative, transformative afternoon where you will make a collage to manifest your heart's desire - and you may be surprised as to what that turns out to be. It's not unusual for participants to start new businesses, relationships, families or career paths as quickly as weeks or months after the workshop. If you are looking for both answers and results to help figure out where you are right now in your life and where you want to go next, this could be thing exact thing you need to push you forward and take you there. Also check out TWM Founder Kristina Leonardi's New Year's Workshop on January 22nd: Review, Refresh and Reboot for 2011! It is the one year anniversary of the Haitian earthquake, and I look back at the past year since it occurred and feel dismayed. It is obvious that the news media slacked off on its intense coverage of the aftermath of the disaster after the early months of 2010, which I understand to a certain extent. After all, the continuous reports of squalor, corruption, crime, preventable illnesses and death were and continue to be overwhelming. The news was and still is pessimistic; there was so much money and other supplies gathered for earthquake relief, but too many in high-level positions have prevented and misused those donations from being used to help those who are really need for a variety of reasons. New tragedies and controversies also began to dominate the airwaves, and many of us began to forget how bad it was and still in Haiti. The events like the BP oil spill and the trapped Chilean miners stuck in perilous living conditions made me realize how we as human beings revel in tragedy to an extent, but eventually we want the hero(es) to save the day and resolve the situations. The villains need to be defeated; there must be a finish line. Of course, in the case of the Haitian earthquake aftermath, there is no foreseeable end to the devastation that continues to wreak havoc on the survivors. There are few heroes and too many bad guys out there, which is beyond frustrating to me and to many of my friends and family members. The “beginning, middle and end” situation is taking too much time for most of us, and I for one can admit this freely. One year later, I make it a point not to forget the enormity of the natural catastrophe and devastating aftermath. Any bits and pieces I hear on the news about Haiti makes me remember and reflect without getting too morbid about it. I remain hopeful that all will turn out well---eventually. What are your thoughts on the year of news coverage about the Haitian earthquake and its aftermath? For several years now (probably close to a decade), I've been wanting to leave New York and live somewhere else for a while. At first, it was completely out of my control because I was still living at home, but since then, I haven't taken the opportunity to move out of the state. In this past year, I've had my heart set on moving to Paris. I haven't fully considered the logistics of such a move, but I've certainly been thinking about much more seriously than some people might expect. Somebody once told me that a great way to get yourself to go somewhere is to tell everyone you know and meet that your plan is to go there and, at the very least, I've been doing that. I suppose that's the first step, then. Of course, even I realize that Paris is a bit of a stretch and that, for the time being anyway, I could simply pack my bags and head to another state or another region of the U.S. With that in mind, I've been taking mental notes in my travels. I've visited a lot of states and cities in the last couple of years that I had never been to before and in each new place I ask myself "could I live here?" So far, the only place I could potentially see myself in is Seattle, which makes me curious about traveling to other places in the Pacific Northwest. I have a couple of friends who absolutely love the region, so there must be something to it. So this year, I'm hoping to visit major cities throughout the U.S. that I might be able to call home for at least a couple of years. Having felt how Paris grabbed me immediately, I'm hoping I can find a place in the states that pulls me in just as much. In the meantime, I'll keep preparing myself for my big move to Paris, even if I don't know when that day will come. I'm excited to announce that last week was the official release date of my second novel, CAMO GIRL. I write books for middle and high school students; this one is ideal for 4th-7th grade readers. 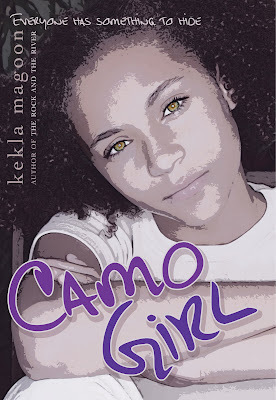 A quick description of Camo Girl: Best friends Ella and Z are outcasts in their sixth grade class. They cling to one another to survive the teasing of bullies, forming imaginary "super-selves" to protect them from their tormentors. When a new boy, Bailey, joins their class, he befriends Ella because they are the only two black kids. But Bailey is popular, a basketball star, and friendship with him means Ella can move up the social ladder--but Z cannot follow. Ella must decide whether to stick with Z and remain an outcast, or abandon her lifelong friend to fulfill her own dream of popularity. In promoting the book the publisher (Aladdin/Simon & Schuster) has said: "Author Kekla Magoon deftly navigates the muddy waters of racial and cultural identities in this contemporary exploration of one girl's attempt to find herself." Although it's fiction, the book certainly takes into account some of my own experiences. My problems and struggles as a teen were different from those of my characters, but the situations I put them through are at least partly based on what I found middle school to be like for me. The book has received some lovely reviews, which is both exciting and gratifying, to know that the story is being well-recieved. For me, most of the pleasure of writing and publishing a book is found in the personal creative process and the sense of satisfaction of completing something solid that I feel good about. But there's no denying the other part of the equation, the part that is about communicating with others and putting a collection of thoughts into the world in the form of a story, hoping that someone will understand and appreciate whatever you are trying to say. For the writers out there, how do you feel about your relationship with your readers? For the readers out there, do you ever think about the author of a book you're reading, or is it all about the text and what it means to you? Resolutions aside, the new year is a great time to recharge your batteries and get focused on new goals and ambitions. Is there anything you're looking to change about yourself or your life in 2011? It's a brand new year and we think it should start by catching up with some of our favorite blogs. Check out what we've been reading. Awaken Your CAREERpreneur asks you to take a look at your life and consider if you ever actually take a break. Girl w/Pen looks back at the latest season of Dexter: from a feminist point of view, just how well did it do? In Good Company recounts one little girl's winter break highlight -- you'll be surprised to read what it is! Lindsey Pollak's blog teaches us how to create a career wish list to get us started for the new year. One Writeous Chick explains why she doesn't like the holidays while spreading some post-holiday cheer. Savvy Ladies wants 2011 to be the year of intention so that we can avoid the mistakes we've made in the past. What did you read or write over the holidays? Share links in the comments! After the holidays, I find it easy to fall back into old habits and routines that I would rather avoid all together. As we all know “old habits die hard,” and the ruts we get into seem almost impossible to get out of. This year, I have decided to remind myself daily to stay open to new experiences, but I am not calling this a New Year’s resolution. I often break resolutions very early on in the year. Instead, I remind myself on a daily basis to take on new challenges, no matter how insignificant they may seem. So far, this method appears to be working. I am making small steps towards showing no fear in my daily life. So far, I have started more conversations with people I meet for the first time, and even flirting when the opportunity presents itself! I am definitely not a natural conversation starter, and am no flirt, but I find that like most people around me, I have tunnel vision when it comes to life. Most of it has to do with personal safety and the regional culture in which I live in; there could be disagreement about this, but I find that people in the Northeastern United States are not as open as those in other parts of the country. I am definitely guilty of that. Now that I am making a daily effort to be more outgoing, I have noticed other people observing me, perhaps with a bit of disapproval, envy, or both. In the past I would be discouraged by these nonverbal observations of others, but my daily reminders to change and be open make it easier for me not to fall prey to this. These and other daily efforts are preparing me for the big challenges I hope to take on in the near future. Since relocation is the most daunting change I plan to make, I find that the small changes I make every day are helping me get ready for the inevitable. If you have stories to share about similar challenges, I would love to hear them! After 2010 kicked our butts, you would think my friends and I would all be eager to so goodbye & good riddance and celebrate the start of what will hopefully be a better year. Instead, all of us were sort of over the idea of celebrating. One friend even said that she was considering getting to bed before the ball dropped and sleeping through the big moment, not waking up until the next morning. My only requirement for the night was that it involve macaroni & cheese and a lot of wine. All of us were basically hoping we could pretend it wasn't a holiday and move on. At the last minute, we figured out a way to celebrate that was just what we needed: something low-key, pressure-free, and fun. Most importantly, we'd be together. My best friend and I made macaroni & cheese with peas, onions and bacon that tasted even more delicious than it sounds. Then we broke out the wine, had dinner with my sisters, and played Taboo and Trivial Pursuit for the rest of the night with a couple of other friends who joined us later on. We took a three-minute break to watch the ball drop, but were otherwise so caught up in all the fun we were having that we kept forgetting what we were there for. Basically, it was just what we needed to distract ourselves from the pain and drama of 2010 and focus on a lighter, happier future. I have to say, it's one of the best New Year's "celebrations" I've ever had. How do you usually celebrate New Year's? It's funny, even though I've been out of school for going on ten years at this point, I still have trouble embracing January as the beginning of a new year. In my mind September is still when things refresh and a new cycle starts, no doubt because that was how life was organized throughout my childhood. There was always back to school shopping in August, awkward first days of class in September, a headlong plunge toward Christmas, when the semester would end and the year was half over. Only half over. I looked forward to the gifts and vacation I associated with the official year's end, sure, but I dreaded New Year's Day itself, because its arrival meant it was time to go back to school. After the holidays, the months between January and June became a downward slide toward summer vacation, the true year's end--a time to relax and recharge before it all started up again. I got so ingrained in this pattern in my formative years that I haven't been able to shake it in the years since. I even still buy student calendars that run August to August, so as not to disrupt my system by switching "mid-year." By all appearances, I celebrate the January 1 New Year along with everyone else. I watch the ball drop at midnight, drink sparkling-cider toasts and make resolutions that I have varying degrees of success at keeping. I wish people a Happy New Year. Yet, there remains a little childish part of me that stamps its foot and whines "but it's not really new year, you know." In a desperate attempt to finally grow up, I've tried using traditional calendars repeatedly. (It didn't take.) I've made grand, sweeping resolutions in an effort to more significantly mark the change...but that usually leads to quick, plunking failure. Have you embraced the New Year?